I noticed I could see the lines @ 120hz and worse @ 144hz. The screen also has a standard 119hz mode though. I tested that and the lines were completely gone (verified by me, my girlfriend and another friend who can easily spot them). So I went into Nvidia control panel (you can also use Custom Resolution Utility, it's free!) and made a custom resolution. The only thing I did was set 144hz mode, but change the actual refresh to 143 hz (you have to choose a decimal value between 143 and 144, I went with 143.00hz) and guess what... it's gone! I don't know if it transfers to games but it's a very obvious difference and I thought perhaps you (or others) could try this as well if you've got monitors with this 'issue'. I got the idea from what I noticed at 119hz vs 120 and read that some ASUS models could get rid of the issue by making custom resolutions as well. This fixes all 'movement' of the screen including those lines whilst it doesn't affect image quality in windows at all. Please let me know if I'm on to something here if you've got a monitor with visible lines lying around! EDIT2: For some reason this only works with Blur Reduction off... If I turn it on, the lines are gone at 144hz, but visible at 143, tested 10+ times... Really strange, but true for some reason. Seems to have to do with the fact that Blur Reduction usually only works at 120 or 144hz, by turning it on through FPS1-mode it forces it on 143, causing visible lines. 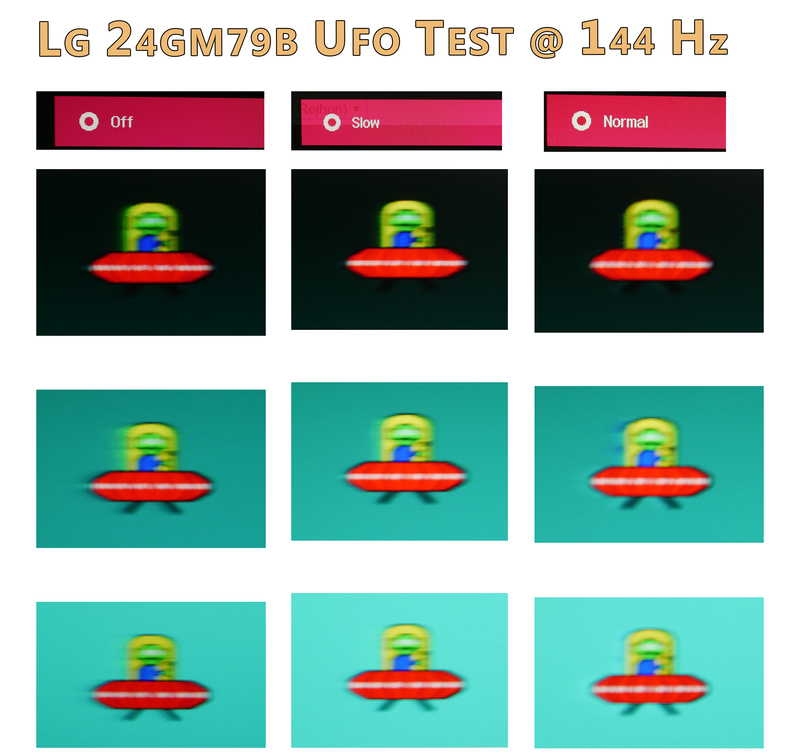 All measuring datas from the LG 24GM79G review. Suggestions, questions, critism, and new ideas? Post them in here. 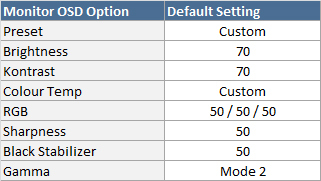 Very important to the topic "the optimal OSD settings". 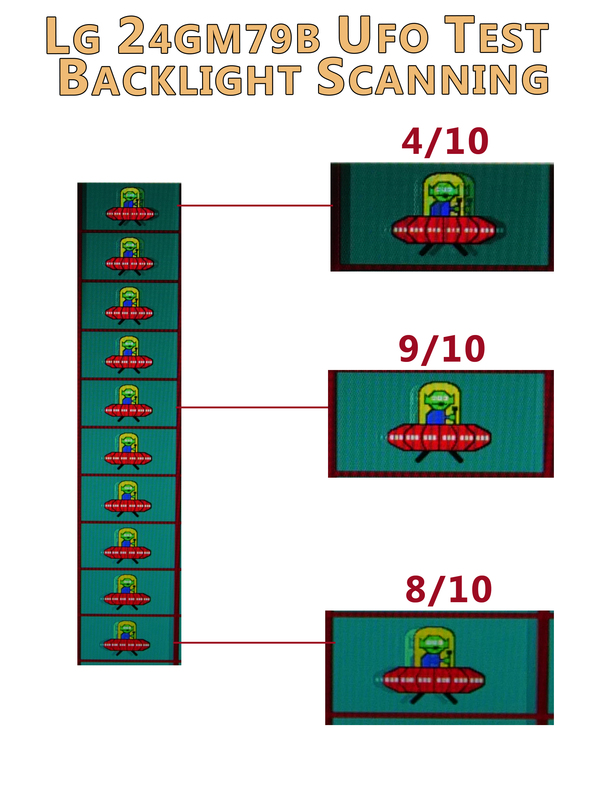 Regarding the Horizontal + moving scanlines from bottom to top. Only visible @ uniform mid-bright image content like grey and when looking very close to it (from a distance of approximately 30cm). I wouldn't say necessarily that this is a "real" disadvantage. It's by far not that visible like the scanlines from the CHG70 or the PG348Q for example. It also isn't possible to capture this on camera. 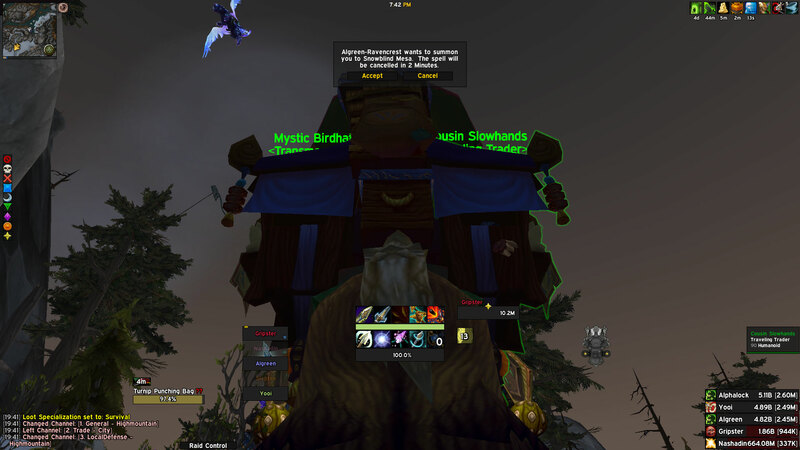 These scanlines are not as usual "scanlines", they are like vertical thin "darker" bars traveling from bottom to top. I've bought this monitor and gotten it today. Coming from Asus VX239H i must say colors are not as nice, as Asus has an IPS panel. I have set black to 0 and gamma to 3 as well, looks better but still of course TN is TN. Gonna test Freesync and 144 hz to see if it was a worthy upgrade or not. Hey Lim! Thanks for the review. I just didn't understand something, how should I set up in the OSD the color, gamma, etc.? Or do you mean which settings? You should set the black equalizer to 0 because it also raises the overall black level @the LG. By overdrive you mean response time set to normal instead of fast? I didn’t notice any yesterday when playing. Doesn’t help with input lag? Would you say gamma 4 and black equalizer at 55? I like you review of this tournament. Because of this i bought my monitor LG 24GM79G-b (ViewSonic was sold out). So before i had Samsung 2235LW (TN panel) so i was hopeing this new monitor will be same or better looking at colors and image quality. But i was disappointed colors and image quality is worst then 10 years old TN. But ok washed colors i will try to used to it but brightness is to strong especially on night when i am tired. So i will try to put LED strap behind monitor and i use night mode in windows to little kill white light. So i copied you settings (i now it is not the same but i hope it will be at least 90% similar). Only difference is i put Gamma 3 and Brightness 0. (now i put color temp Medium to try). 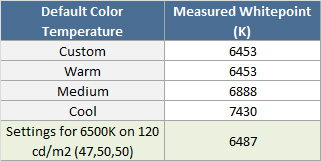 Later i see all 144hz monitors have terrible colors and very strong Brightness. So sorry for long intro but my question can you please do some test or how to make colors more deep or vivid i am using Nvidia card. I ask you this because i game World of Tanks i see they have options to make color adjustment. I will send you pics (they are bad because of cell phone) but you will see what i mean. I like the mos Deep or costum better colors less white and easy for my eyes. But i was disappointed colors and image quality is worst then 10 years old TN. My old Samsung 2235LW it had bad view angels but it was not this much bright so it was more pleased to watch and read. ReShade is for games and some games will ban you for using it, i would like to have stronger colors in Windows i dont expect IPS quality just a little deeper colors and less white. Hope you understand. I cant take a photo because my bad cell phone and i see lot of horizontal lines (not visible with eyes). That is why i am asking you and you are a lot experienced in monitors calibration. I'm not experienced in any of this but have the same monitor. Check the NVIDIA settings on the NVIDIA control panel. Go to Display -> Change resolution. In there make sure the output dynamic range is set to full and not limited. 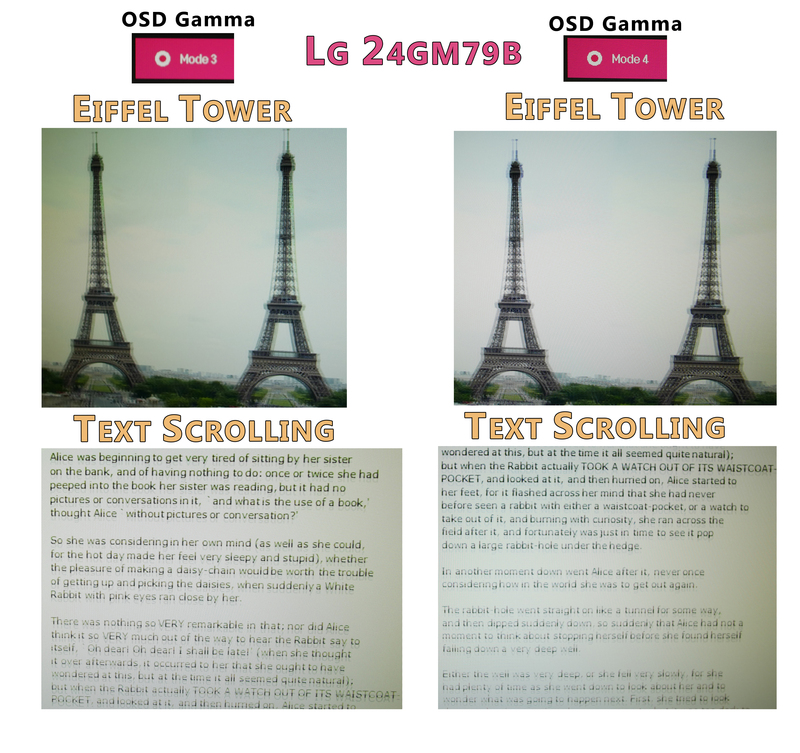 thanks to your reviews i decided to buy the lg 24gm79g - 250euro at the time and cheaper than the viewsonic - so thats mostly why i got it to save some money. I am pretty happy with the monitor itself - good design - the stand is better than its given credit for - i think. since i am coming from an eizo foris 2427bk (ips) i am having some trouble getting used to the colors as they differ alot. most troubling for me is how badly color shifts are represented. the lagom test seems "fine" but sometimes ingame in stuff like WoW or Farcry 5 stuff looks just wonky. is an example - i hope people can click on it. something seems off - maybe thats normal and i am just not used to stuff looking as "ugly" as this or its the monitor - or i was not really thinking when buying a tn panel cuz thats normal. my settings are probably not optimal either - i am fiddling on a daily basis with it - brightness seems pretty high even on 40 gamma mode 4 and no strobing activated. Yes i did that, and now i put on Nvidia settings Contrast 60% and Digital vibrance 60%. this is popular monitor and lot of people buy it because your review (i read on other forums). And u said that this monitor have best colors and picture quality? Than i feel sorry for Samsung, Asus, Benq, etc. If you still have this monitor can you look at it one more time?